Comic fans around the world look forward to Comic-Con all year, but many women feel there are some aspects of the convention that they can do without. Now an organization of young women known as Geeks for CONsent wish to spread the word about the sexual harassment that can go on at these events and what management can do to put a stop to these incidents. The New York Daily News reports about the geeks for CONsent, founded by three Philadelphia women, that is asking for a formal anti-harassment policy to be put into place at Comic-Con. 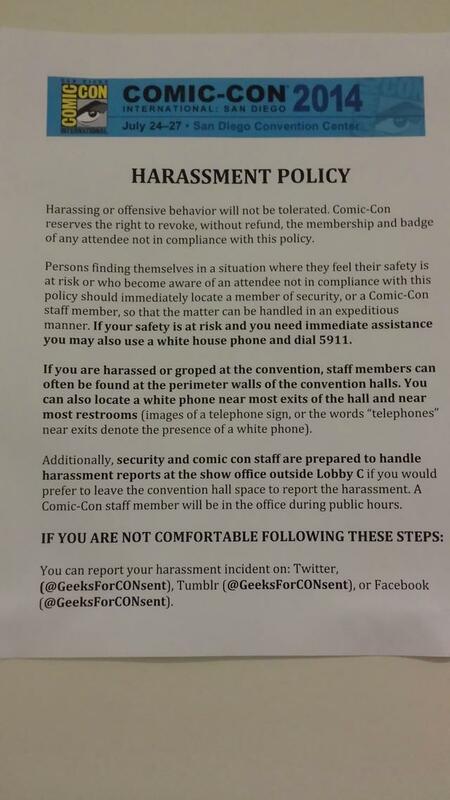 So far Geeks For CONsent have 2,600 signatures on their petition to instate a policy that forbids the type of sexual harassment many women have reportedly faced while attending the convention. Have you ever attended Comic-Con? Do you think organizers should do more to enforce their anti-harassment policy? yes I have attended comic con and other scifi conventions. I don't dress in costume, but I have been followed. and hit on. Never touched, tho. i have seen some outfits that are very skimpy, and when you dress like that in public there is always going to be some loser somewhere that will try something. When i go out to the clubs and wear something skimpy, i always have a few friends with me to avoid this type of problem, or to take care of the guy that does cause a problem. Yes the organizers need to do something, but women also need to watch out for probems, especially in an environment know to have problems. Stick together, carry a whistle, and yell and point out the men who get out of line. that will embarrass them, and hopefully they wont do it to another woman.